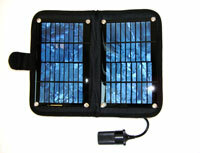 Thuraya Solar Charger can power up your Thuraya phone and recharge its battery in areas where no electricity is available. Now you can go anywhere with the Thuraya phone and you won't have to look for an electricity outlet! Just connect the Solar Charger with your Thuraya handset (a car cigarette lighter adaptor is required) and the sunlight will do the rest!